After a terrible chemical-warfare attack, your city is in ruins. Help your character through the traps and surprises that lie in wait. You are "Alone". Everyone has evacuated the city and the ones who didn't make on time… well, they don't look too good! Find a vaccine for yourself before it's too late. Your girlfriend may already be infected, so you must find a cure for her too. Work your way through the levels and find everything you need to survive in the city. There are rumours of an antidote at some military installations nearby. Read the story of each level to see what your objectives are. Good luck! 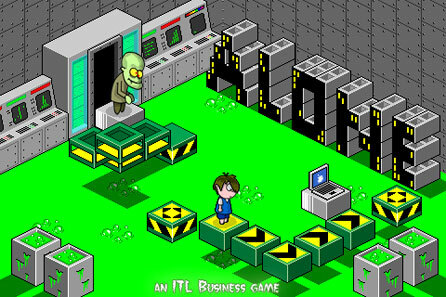 "Alone" is a classic room based isometric platformer game. It uses simple controls and it's easy to play. Don't worry about saving the game, we automatically do this for you. We bring you peace of mind so you always can resume your game at any time you like. 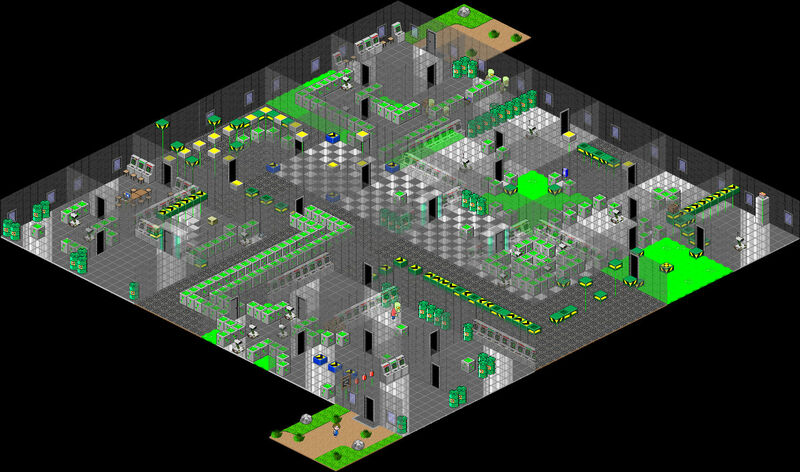 The game will probably remember you those wonderful ZX Spectrum isometric games! Enjoy the power of a game with alnost unlimited levels. Before you are finished with the original levels, we will have some more available to download. Just visit the downloads section from time to time. To move your player you can use the buttons on screen (visible or hidden) or you can use the corners. If you use the corners, either touch once to move your character in that direction, or keep your finger on screen to continue walking. Double-taping on a corner will make your character jump. Remember to keep your finger on the corner of the screen after the second tap to jump in that direction. During the game, you can pause the action and access the inventory screen using the pause button. If you have chosen to hide the pause button from the settings page, you can tap the screen with three fingers to make it reappear. 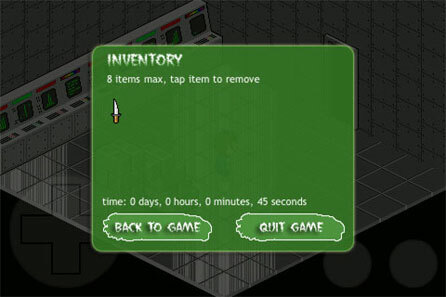 Once you have opened the inventory, tap the objects to remove them. 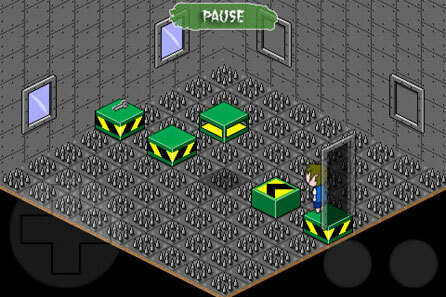 Objects removed will return to the original position when you revisit the room. Use weapons to kill your enemies. Once you have collected a weapon, you can shoot by swiping the screen towards the direction of the enemy. On the settings page you can enable or disable the loading of annexe rooms. Disabling this option may load rooms faster, but you won't see the adjacent room. Be aware that objects cannot be pushed to annexe rooms. 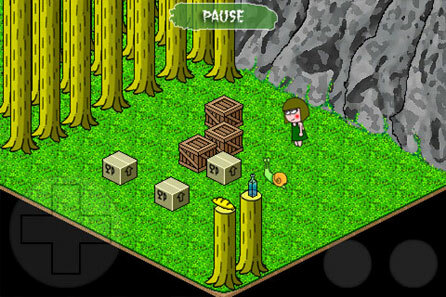 Some objects will keep their position on the screen when you re-visit the room, but others will reset their position. This is useful to resolve some of the situations you find yourself in. If you die, you will just return to your last position. We understand level The Labyrinth can be a bit difficult, so that is why we are providing you a map! Click here to open the map in a new page. We are a very small team (two people only!) and we are constantly working on new games and updates. But if you finish all the levels and you are still hungry, please give us a shout and we will update you as soon as new levels are available. 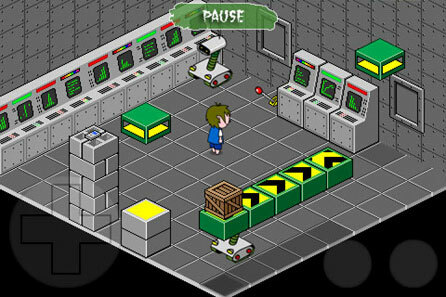 You can also visit this page from time to time to see any new levels. 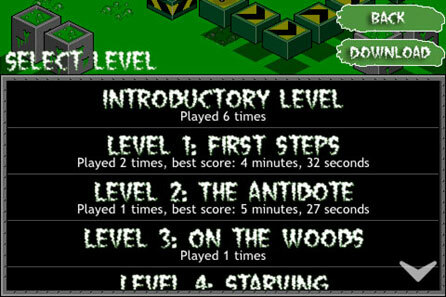 Or even better, check your iPhone/iPod Touch, as you have a "Download" option on the levels screen. * The personal data requested on this site will be used only to contact you (via e-mail only) regarding the subscription. The data we collect will be held within the UK and will not be shared with other organisations and will not be used for any other purpose. If you are having any trouble, or need any help please don't hesitate to contact us. We will help you and will try to reply as soon as we can. When you use our contact form, please quote the game "Alone" and put a working email address so we can reply to you.